Ze Frank recently linked to a wonderful Web 2.0 parody song/video called ‘Here Comes Another Bubble‘ by an a cappella group called The Richter Scales. 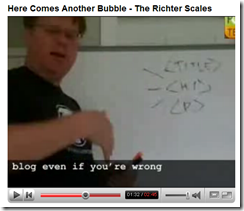 I particularly like this moment from 1:36, with Scoble being used as the backdrop to “blog even if you’re wrong”. Much as I enjoy it, I would make one observation. The wall of Web 2.0 logos shown between 0:12 to 0:16 seems to be from this famous image on Flickr by Stablio Boss. I notice this is licensed Creative Commons Attribution Non-commercial Share-alike yet I don’t see any attribution in the video or on the group’s site. Update: a new version of the video, with credits, has been released. I’ve replaced the embedded video with the new version. I like the recursion in “won’t you blog about this song”. Fantastic. I can’t speak for Stablio, but I do know that many of the logo owners were delighted to be included in that collection. You have a point though. Re Billy Joel, I’m not sure how far ‘fair use’ takes you, but doesn’t it make allowances for parody? United States Supreme Court, Campbell v. Acuff-Rose Music, Inc. (1994) probably about covers it. Although, the fact that it wasn’t commenting on or criticising the original We Didn’t Start the Fire could perhaps count against it. Looks like it’s been DCMAd. Interesting. Switching over the Metacafe version, for now. Here‘s the story behind the take-down from YouTube. In short, Lane Hartwell objected to the unattributed use of one of her photos. The Richter Scales have acknowledged this and promised to provide all of the appropriate attribution.